This is a hack of Red and Blue that imitates the recently-leaked Gold and Silver demos from Space World 1997. 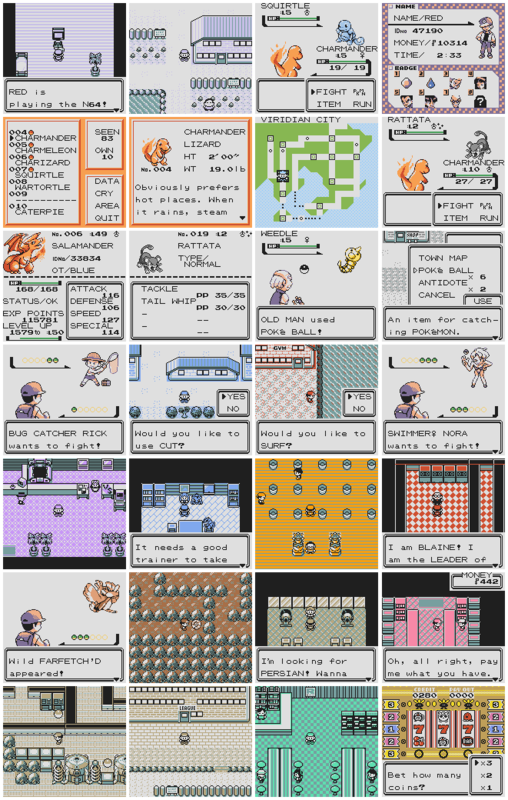 It replaces the Pokémon front and back sprites, trainer sprites, tilesets, overworld sprites, SGB borders, and other graphics; ports features like shiny Pokémon and in-battle experience bars; and makes all 151 Pokémon available in one game. For a full list of features, see FEATURES.md. Wow, this was so fast, just a few hours ago I found in Instagram the old sprites and now we have a first hack. In my folders with ideas of Pokémon Hacks was the idea of doing a "Red/Blue Part II", which was a bridge between the events of Pokémon Red and the Beta of Pokémon Gold (which some information was on the Bulbapedia before the Demo). Explaining the trail of Red until he battles Gold on Mt. Silver. EDIT: For some reason, Lunar IPS says: "The file has been patched, but the data in the IPS file appears to be truncated or misaligned.."
The pokered.ips makes Pokémon Red become 15 MB and the pokeblue.ips makes Pokémon Blue become 9 MB. I'm considering referencing Space World 1995 in my own hack. Only problem is where to put it. This is awesome! Would you be willing to create a version that only changes the back sprites and leaves the front sprites as is? The back sprites seem to be based primarily on the blue sprites anyway. Additionally, I like the trainer backsprite you used but the Poketto one would be nice to have as an option since it's much more faithful to the original. Actually, the next release is going to have even more changes: trainer sprites, tilesets, elements of the Pokédex and trainer card UIs, the battle HUD, the textbox frame, all that and more is being ported from prototype G/S. If you just want the back sprites, read how I added them here. You can take those files and edit main.asm to replace all the INCBIN "pic/swmon/whatever.pic" with INCBIN "pic/bmon/whatever.pic". I don't know what the Poketto back sprite is, but that can be edited as pic/swtrainer/redb.png. All right, thanks for the info. I'll try to create a version with just the backsprites and share it for people who might prefer that. For a while I've wanted of version of the 1st Gen that retains the charmingly off-model sprites but updates the super low-res backsprites. That's actually pretty awesome for a Pokémon sprite hack. This hack of Red/Blue actually made me think of something for a moment. What if we could re-create what the prototype Red/Green was like before the debugging stuff was removed from it's code? The Spaceworld 1997 demo of Pokémon Gold and Silver are actually the closest games you'd be able to get in regards to a prototype Red/Green, as they originally forked from an early 1995 debug build of Red/Green and then stripped of it's Pokédex, sprites and map code, which would probably explain why it has less sound effects and music than the released Red/Green (not Blue though). The update is finished! These are now called Red★ and Blue★, with a lot more than just Pokémon sprites changed. Please see the top post for details. I was wondering, how could I properly build the colored GBC version for 3ds virtual console? Currently I'm getting all monochrome running in VC GBC. Here's a complete changelog on GitHub. Minor update today: the "Game Freak Presents" intro uses some Space World graphics, and more importantly, overworld sprites are aligned with the tile grid instead of being shifted up 4 pixels. This may look weird at first, but it's how the Space World demo worked. Please try out the new patches and let me know if this feature has any bugs! Just reporting a old strange bug: when you buy the magikarp and you choose to nickname him, it causes the pokémon center a inofensive graphic glitch. I didn't tested if this happens in the new patch yet. The overworld seems glitch city, my characters were renamed to N*inten and I can hear a strange pokemon cry after pressing START/A at the Red*Version or Blue*Version intro. I should have did a backup..
Nevermind, I just patched it over clean copy roms instead the old patched ones and now it's working as intended. Is Pokémon Yellow★: Space World Edition a thing that could happen? Why would you want that? The game already isn't a looker as is plus it would probably look like garbage because Yellow used the anime inspired sprites and I think those would have to be either reworked or removed and replaced to maintain the Spaceworld feel and look. I think that's why I never liked it in the first place despite a handful of promising hacks. I always was a Red & Blue kinda fan and I did play a rather screwed up translation of Green for curiosity but Yellow just looks weird to me. This looks awesome! I dunno why, but the G/S prototypes graphics have quite a charm to them. I know you posted the code publicly, but for certain, you wouldn't mind if somebody made a version with extra pokémon right? If so, I might do such a thing. Edit: Also, sorry for the necropost, didn't see the date.